India is the third country after U.S. and China in terms of the sheer population of over-weight people*. Needless to say our junk food choices and sedentary lifestyles are to be blamed for this. So, it’s time we #BreakUpWithJunk and move on to healthier snacking habits. Good news for them who make long faces at healthier foods (as they cannot be tasty is the popular myth) Saffola Masala Oats has come up with delicious oats based recipes that you can enjoy guilt-free and #CraveNoMore for taste. Since Chinese and Italian are the flavors we crave for the most during snacks, Saffola Masala Oats has gone ahead and launched the new Chinese & Italian flavors. We have seen many battles on fields, looking at its historical references and epics, but battle of flavors? Doesn’t it sound unheard of? Not any more, thanks to New Saffola Masala Oats Chef’s Choice, Chinese and Italian Variants. The launch was marked by a historic battle between two sets of talented celebrity chefs and top food bloggers of the country. Two teams got together to settle the everlasting debate on whether it is Chinese or Italian in one of the first of its kind food truck challenge in India. 6 bloggers, 2 teams and 3 celebrity chefs - Ambience Mall Gurgaon experienced India’s fiercest culinary battle on Saturday; a battle between flavors, a battle against junk food and unhealthy snacking! While it all began with the launch of Chef’s Choice range witnessing top bloggers flying in from across the nation, six winners qualified for the final and last leg of this culinary extravaganza- the Food Truck Challenge organized today. Fought between Chef Saransh leading the Chinese Food Truck and Chef Shipra mentoring her Italian food brigade, both the teams presented some unthinkable chatpata snack dishes loaded with the goodness of oats. Saransh prepared ‘Chinese Ghotala’ which was devoured by Chinese food lovers. On the other hand ‘A Nutty Affair’, Shipra’s special became a super hit among Italian food enthusiasts. At first the people could not believe it had been made out of Saffola Masala Oats. ‘If oats could be this tasty, I don’t mind switching my snacking habits’, said an ecstatic member from the audience. “I would like to thank Saffola Masala Oats for giving me this exciting opportunity of running my own Food Truck. It was great churning out some interesting guilt-free Chinese dishes. Gone are the days when healthy was not considered tasty. 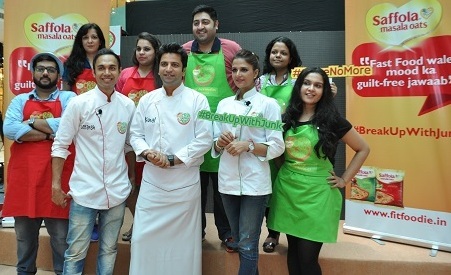 I am all charged up to say no to junk food with Saffola Masala Oats, and Iam sure we have inspired many more today to adopt healthier eating habits,” said Chef Saransh Goila, who was leading the Chinese food truck comprising of Adarsh Munjal from the Big Bhookad, Saloni Malkani from FBAI and Priya Sharma from Mumas Food Diary. Chef Shipra Khanna was leading the Italian food truck which comprised of Kumar Jhuremalani from Pet Pujaris, Sayantani Mahapatra, of A Homemaker's Diary and Shivangi from Shivangi Reviews. She looked overwhelmed by response to her Food Truck and commented “I loved the concept and the fact that so many people came to try our delicious snacks made out of Italian flavored Saffola Masala Oats. Chef Kunal Kapoor acted as the perfect mentor and judged the teams, declaring Team Chinese as the winner. The Chinese Hearty Dragons made some exotic dishes to fill the Ambience mall periphery with interesting aroma which attracted many consumers. Needless to say, they loved the dishes and were craving for more. Talking about the initiative, he said, ‘It’s important that we integrate healthier snacking habits in our lifestyle at an early stage. With the growing instances of lifestyle disorders, #BreakUpWithJunk is the need of the hour. The three winnersof this grand event will feature in the ‘Crave No More’ segment presented by Saffola Masala Oats show aired on Living Foodz. The war against unhealthy fast food turned out to be really exciting, inspiring a number of people to #BreakUpWithJunk!